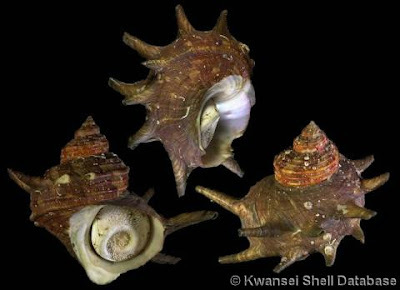 Horned turban Turbo cornutus, copyright Kwansei Shell Database. The Turbininae are a group of marine gastropods with strong, solid shells bearing a calcareous operculum; whorls may be rounded or more or less carinate. [HW78] Hoffman, D. L., & P. J. Weldon. 1978. Flight responses of two intertidal gastropods (Prosobranchia: Trochidae) to sympatric predatory gastropods from Barbados. Veliger 20 (4): 361–366. [LYR78] Linsley, R. M., E. L. Yochelson & D. M. Rohr. 1978. A reinterpretation of the mode of life of some Paleozoic frilled gastropods. Lethaia 11: 105–112. [WMJ09] Wells, F. E., M. Mulligan & D. S. Jones. 2009. Prevention of introduction of species brought into Geraldton Harbour, Western Australia, by the dredge Leonardo da Vinci. Records of the Western Australian Museum 25 (2): 153–158.